The inclusion of the Marshall London was because it claims stereo MEMS microphones, just like the best Lumias, i.e. is 'gig ready'. We'll see. And the order of the devices above was messed up slightly by me (ahem) forgetting to shoot with it at first. Oh well. Yes, there are a hundred other devices and OS combinations I could have tried, but these are only data points at the end of the day. 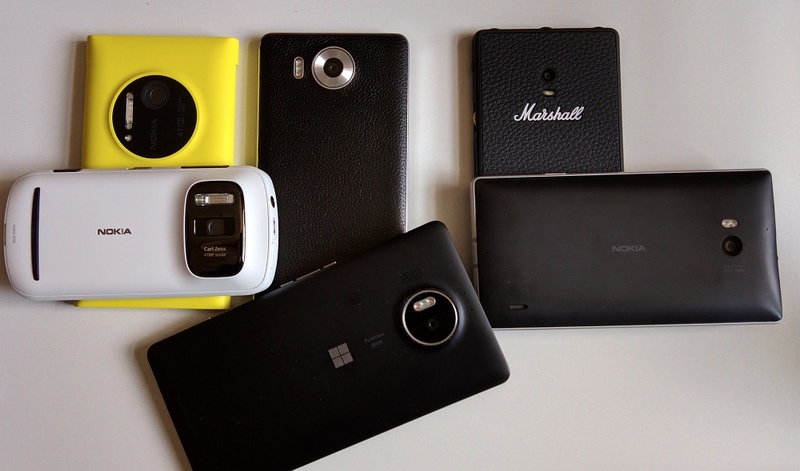 What I was particularly interested in was how the various generations of Nokia/Lumia fared against each other - and also whether that Marshall phone could come close. sitting in my summerhouse, looking out on a quiet garden - listening for birdsong and, well, silence - is there too much hiss from the phone's audio capture system? by a breezy, fairly noisy road - here looking at how well the microphones in the phones resist/cancel out wind noise, mainly. in a gig situation (ok, a jam night), testing how well the phone's microphones stand up to rock decibels! And it was loud - very loud, I was sitting right in front of the PA and drum kit and my ears are still ringing 12 hours later! I then compiled the footage from all the smartphones into a montage, with comments below on how the various smartphones did. Bear in mind that the video below is hosted on YouTube, and so some of the service's compression will have been used, though I wouldn't expect that to affect audio much. Note also that the video side of things is deliberately only at 720p - I wasn't testing the picture side of things at all, so I kept things quick and light. Here's my assessment of how each smartphone did on the audio front. Note that this would be the point in a cross-device video capture comparison where I point out that the 'gig' bit is a non-starter for most smartphones because they simply can't cope with the volume - yet every phone here coped well, thanks to Nokia and then Microsoft (and Marshall's) use of MEMS high amplitude microphones. Amazing. Nokia 808 PureView: decently low noise during video capture (and lowish frequency) - it's why I use it to film my Phones Show to this day; good wind resistance when shooting outdoors; exemplary gig recording at the loudest levels - the audio this produces would pass for a professional live album soundtrack. Nokia Lumia 1020: slightly louder background noise and higher pitched (and so more noticeable); microphones pick up more wind noise, but not showstoppingly so; excellent gig recording, if not quite up to the 808's level of dynamics and crispness. Microsoft Lumia 950: horrible left channel clicking artefacts are evident - I've been reporting these to Microsoft for months - it's definitely a software thing. I'm guessing an issue in the firmware; greater susceptibility to wind noise, not helped by the mike seal issues, plus note that audio from my voice was quiet because only the rear-facing microphones are used in video capture at the moment - again a software limitation; gig recording was 'OK', helped partly by a slightly mellower piece of music being played here, but looking at the waveforms in my video editor, there were significant digital distortions - again, a software issue. Roll on production Redstone for all! Microsoft Lumia 950 XL: excellent low noise levels and capture in all conditions, with the exception being the same susceptibility to wind noise as on the 950 - I'm wondering whether this can be fixed/cancelled/filtered in software? Gig recording was pretty good, though I did feel as if the audio lacked the depth of that from the best here - it sounded a bit 'thin'. Lumia 930: digital noise was again disappointing - anyone else get the impression that Microsoft hasn't really optimised Windows 10 Mobile for the Lumia 930? I'm guessing it's not high on their priorities - after all, it only recently got stereo sound again! Great gig sound again though. The Lumia 950 is clearly underperforming here - my gut feel is that its firmware is letting it down - maybe I should bump it up again to Redstone, since the 950 XL performs vastly better in terms of audio capture - and the microphones and electronics are (in theory) the same? The Lumia 1020 is the stalwart it always was and probably still the best compromise overall when it comes to great video capture for picture and audio plus a workable modern OS (in this case Windows Phone 8.1). While the Marshall London impresses mightily for an Android phone in terms of audio but can't compete in terms of picture quality, and the Nokia 808 is left as the gold standard, yet again - this is now a four year old phone and its output is still bettered by nothing else in many ways. Comments welcome of course, if you have time to watch - and listen to - the video above. Do you agree with my assessments?